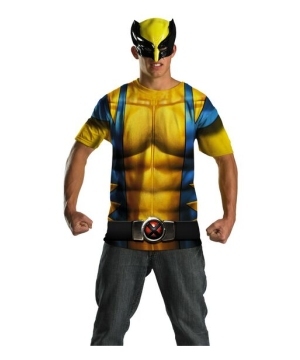 Be the best X-Man you can be in a Wolverine costume. 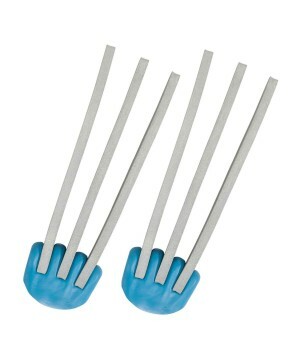 Wolverine is a classic icon of Marvel comics and one of the most prominent members of the X-Men. 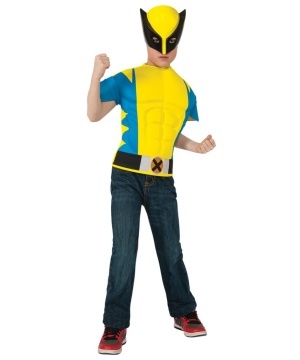 This Halloween, make sure to pay tribute to Logan as you portray one of the fiercest and most well-feared Marvel characters. 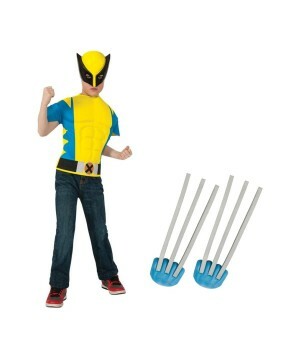 Find your Wolverine Costumes from the Movie in Kids & Adult Sizes. 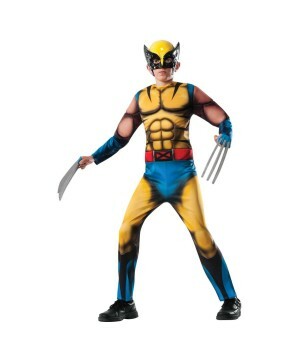 Wolverine costumes are as popular as the character himself. Wolverine, otherwise known as Logan, is what might be called a breakout character, or a character that is introduced as a part of a group, but endears himself to the audience in a way that he becomes a fan favorite and the team’s defining face. Created by Roy Thomas, Len Wein and John Romita Sr., the Wolverine is a relatively new character with him being introduced in 1974 in an issue of The Incredible Hulk, before joining a revamped team of the X-Men, and becoming the group’s most recognizable member. 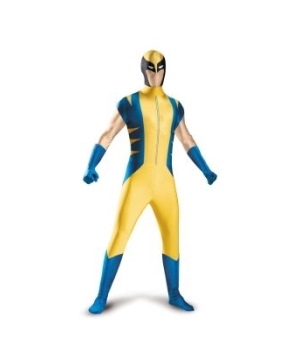 Wolverine’s combination of mysterious backstory, adamantium claws and snazzy costume all hinted at a classic character in the making, but it wasn’t until Chris Claremont and John Byrne’s run on the comics that Wolverine attained true greatness with stories every week that thrilled, and a costume that made adults want to suit up as the Wolverine. It is during these times that Wolverine reached peak popularity, and the writers capitalized on the same. Thanks to the excellent run of solo stories during this period, and Wolverine’s contribution to ‘event’ stories, Wolverine finally reached pop-culture immortality. 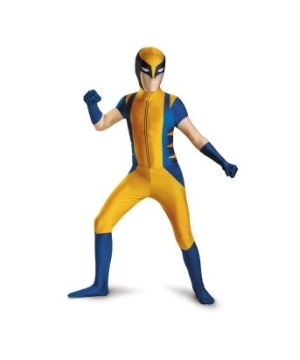 It is but small wonder that Wolverine features on countless Top 10 lists of superheroes, story arcs, or costumes, because while Wolverine’s costume today may not resemble the classic costume, it still remains iconic and this is most evident during Comic Con or Halloween, where for every three Hugh Jackman Wolverine costumes, you can find two classic Wolverine costumes. In fact, when Hugh Jackman was first announced to be playing Wolverine in 2000’s X-Men, the concerns weren’t revolving around how a theatre and musical actor was being given the role, but around his appearance, more specifically how Hugh Jackman is about a foot taller than his comic book counterpart, and his black leather costume looked nothing like the comic book costume! Of course, such concerns seem trivial almost seventeen years later now that Hugh Jackman is Wolverine, and fans are getting teary-eyed at the mere thought of Hugh Jackman being in the role one last time, before they get another iteration of the character. And why shouldn’t they? Hugh Jackman proved very skilfully that costume or no costume, if an actor is faithful in his re-enactment of his comic book counterpart and captures the spirit as it was meant to be, fans will happily accept the character irrespective of how different his costume looks, all while respecting the costume or iterations of the character that have already been. Hugh Jackman might be too tall, handsome or refinedly gruff in his demeanor, but that makes him different, and fans are all too happy to cosplay as Hugh Jackman’s Wolverine for that very reason! 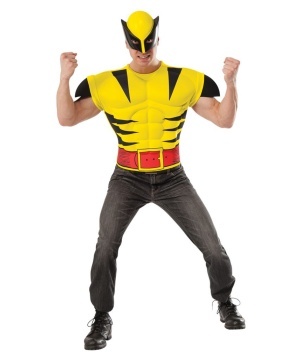 The movies have shown Wolverine to have only three costumes as such – a tank top and jeans, the black leather costume, and the tan armor costume – with the possibility of the yellow costume making an appearance in 2017’s final flourish, and nothing would make the fans happier than to see their definitive Wolverine in his definitive costume, because make no mistake, the yellow costume remains the definitive Wolverine costume thanks to its stylistic flourishes. 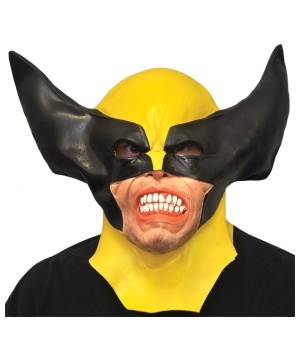 We at Wonder Costumes are as big fans of Wolverine as our clientele, and always keep endless Wolverine costumes in stock to ensure we can be fans’ one stop shop for Wolverine costumes, whether they’re looking for toddler costumes, full sized deluxe costumes, masks or gloves. 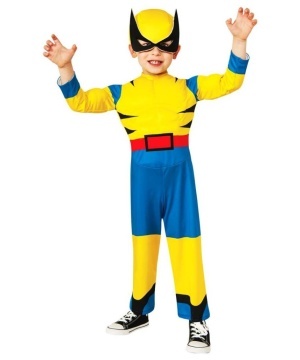 With Wonder Costumes, fans are always just one click away from deploying their adamantium claws, donning their iconic costume, and setting off to do what they are best at!